Abortion & Breast Cancer - Is There A Link? Is There A Link? What Is The Truth Behind The Controversy? Click on any of the References (1-9) and you will automatically be scrolled to the References Section at bottom of page. In 1970, breast cancer occurred in 1 out of 12 women. In the 1990’s that number increased to 1 in 7 women. Breast cancer is the only major cancer that is on the rise. In 1973, abortion was legalized in this country. Since then, invasive breast cancer has increased by 40% and non-invasive (in situ) breast cancer by 400%. Breast tissue contains lobules, which are composed of a milk duct and some ductules (milk glands). There are four types of lobules. Before a full-term pregnancy, the breast is composed of 75% Type 1 and 25% Type 2 lobules. Type 1 lobules are where 85% of all breast cancers start as ductal cancers. Type 2 lobules form 10-15% of breast cancers which are called lobular cancer. Types 3 & 4 are resistant to cancer. Induced abortion before 32 weeks leaves more breast tissue vulnerable to cancer because of increased exposure to estrogen hormones causing increased numbers of Type 1 & 2 lobules formed during the first half of pregnancy. In June 2005, the World Health Organization concluded after review of all studies to date that estrogen-progestin combination drugs used in birth control pills and hormone replacement therapy (HRT) actually cause breast, cervical and liver cancer. This is a higher classification of risk than previously reported (1) Increased breast cancer risk occurs whether these hormones are given orally, by injection, by absorption through the skin, or other means (e.g., birth control pills, Depo-Provera, the Patch, or vaginal rings). Even the newer lower-dose formulations, called “mini-pills,” still increase breast cancer risk. Hormone replacement therapy (HRT), prescribed for the side effects of menopause, such as hot flashes and mood swings, also increases risk through the same mechanisms as birth control pills. The greater the number of years women take HRT, the higher the risk.One potent synthetic estrogen, DES, has been found to increase risk in mothers and their daughters when taken during pregnancy. (2) Like any medication, hormones used carefully and for short periods can be beneficial. Used for long periods of time, they can significantly increase breast cancer risk.Alternatives to the use of these steroidal medications exist, which do not increase breast cancer risk. How Does The Link Between Abortion and Breast Cancer Work? As soon as conception occurs and even before implantation in the uterus, the embryo secretes a hormone, hCG (Human chorionic gonadotropin), which causes the mother’s ovaries to produce more estrogen and progesterone. This causes the mother’s breasts to become sore and tender. In a viable pregnancy, estrogen levels increase 2,000% by the end of the 1st trimester. This surge in hormones causes the breasts to grow by making more Type 1 & 2 lobules where cancers can start. The breast doubles in volume by 20 weeks. 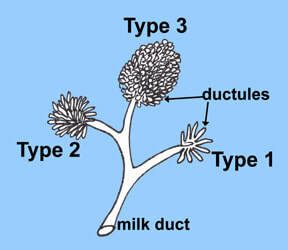 After 32 weeks of pregnancy, the Type 1 and 2 lobules mature into Type 3 and 4 lobules in preparation for breast feeding. If the pregnancy ends by elective abortion, the increase in numbers of Type 1 and 2 lobules formed in the first two trimesters provide more places for cancers to start, increasing risk. Women who never carry a pregnancy beyond 32 weeks never fully mature their breast tissue and have increased risk. Women who delay full-term pregnancy past age 30 have a 90% higher risk of breast cancer than those who carry a pregnancy to term by age 20. ​​If induced abortion is a problem, does spontaneous loss (miscarriage) in the first trimester carry the same risk? Denies herself the risk reduction of a full-term pregnancy. May never have children—a risk for breast cancer. Or, delay a full-term pregnancy which increases her risk of premenopausal breast cancer by 5% per year delayed after age 20. Denies herself a further 10% reduction in risk by another full-term pregnancy. Will have increased the number of Type 1 & Type 2 lobules where cancers start in her breast. Raises her risk by the independent link. ​(1) Cogliano V, et al. Carcinogenicity of combined oestrogen-progestagen contraceptives and menopausal treatment. Lancet Oncol 2005; Aug 6(8):552-3. (3) Witt BR, et al. Relaxin, CA-125, progesterone, estradiol, Schwangerschaft protein, and human chorionic gonadotropin as predictors of outcome in threatened and non-threatened pregnancies. Fertil Steril 1990;53:1029-36. (4) Stewart DR, et al. Enhanced ovarian steroid secretion before implantation in early human pregnancy. J Clin Endocrinol Metab1993;76:1470-6. (5) Daling J, et al. Risk of breast cancer among young women: relationship to induced abortion. J Natl Cancer Inst 1994;86:1584-92. (7) epidemiologic Studies: Induced Abortion and Breast Cancer Risk.Breast Cancer Prevention Institute 2011; Click here for printer friendly pdf. (8) Shah P, Zao J on behalf of Knowledge Synthesis Group of Determinants of Preterm/LBW Births. Induced termination of pregnancy and low birthweight and preterm birth: a systematic review and meta-analyses. BJOG 2009;16:1425–1442. (9) H. Swingle et al., Abortion and risk of subsequent preterm birth: a systematic review and meta-analyses. J Reprod Med 2009;54:95–108. prior written consent of Breast Cancer Prevention Institute.